Anyone who still buys a toaster oven does so because they fail to understand the benefits that a device like the Oster Extra Large Digital Countertop Oven can provide. A toaster oven’s only real function is to toast bread, pop tarts, and strudels countertop convection offer owners more flexibility and versatility in the kitchen. 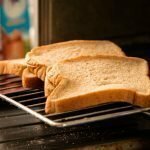 It can work both as a toaster and oven, and in some cases, you can even do rotisserie in the same appliance. Today, it is easy to find convection models as they are becoming one of the more popular kitchen appliances. Picking one might also seem effortless since most models have somewhat similar features. However, you should be careful because their use, functionality, size and cost usually vary. With that in mind, when choosing a convection version, you should select the one with the features that are most important to you. If it’s a smaller size, then you might possibly have to give up the rotisserie feature. If your looking for more cooking choices, then expect to spend a bit more. In case you have decided on searching for one, but you are still uncertain of what features you should look for, this article will be a great help. Today, we’ll review the features of the highly recommended Oster Extra Large Digital Countertop Oven and also compare it with another popular brand’s convection model. The Oster brand promises to offer durable kitchen appliances that provide quality performance and versatility. What is more amazing is that they also have replacement parts and accessories for most of their products in case there are product issues. 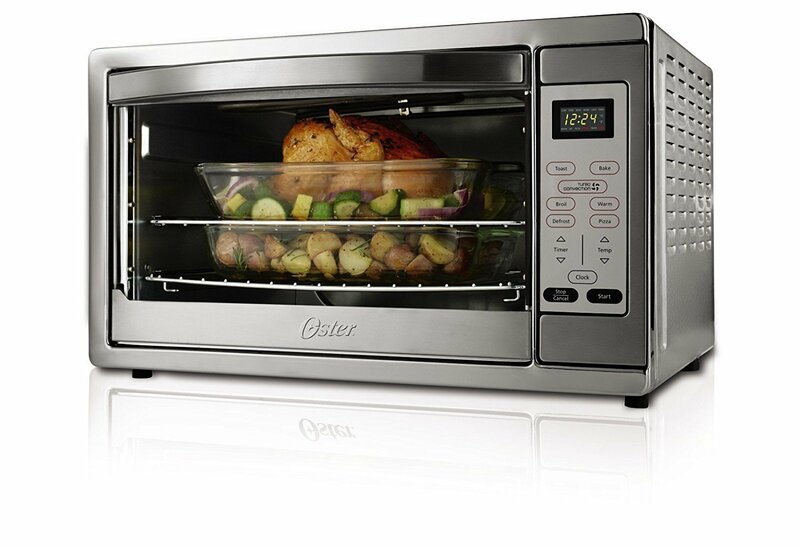 This Oster Extra Large Digital Countertop Oven is one of their products that works using convection technology. 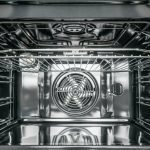 Below are some key features, pros, and cons that can help you decide whether this appliance is for you. 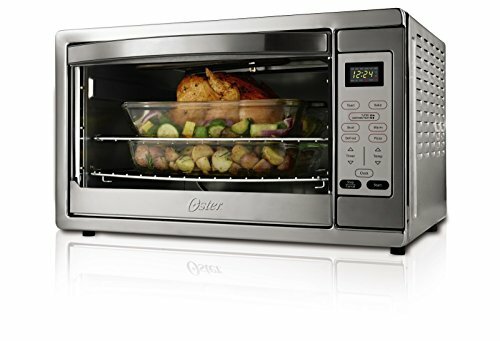 The Oster Extra Large Digital Countertop Oven is an excellent alternative to using your large, traditional version since it can cook a lot of food items and has two shelves. It is also the perfect holiday assistant to aid in accommodating all your baking needs. When you purchase this model, you not only get the convection machine but other cooking accessories to make your experience a bit more convenient. Using and cleaning is also not much of a hassle. You can also set a timer, and it will shut off on its own once done. What is better is that you can either set the temperature required for the recipe or can just press the type of cooking technique you want. In addition, since it comes with a manual and cooking guidelines, you are assured that even if you are a beginner, you would succeed in cooking anything with this model. While this model seems perfect, it still has some shortcomings. For instance, the interior is much smaller than the exterior so you’ll need to plan out the size of your meals accordingly. Also, even though it is made using stainless steel, there is no insulation in the design, so the outside is hot to touch when in use. Nonetheless, it can cook food quickly and evenly. The company offers very good customer service and is willing to refund your money or change the product in case of problems as long as it is within the allotted warranty period. You need to register the appliance on their website after your purchase. The Oster Extra Large Digital Countertop Oven can be compared with the Hamilton Beach 31104 Countertop Oven with Convection and Rotisserie. It is also a stainless steel-made model that can cook food evenly and quickly. The Hamilton Beach model offers the same versatility as the Oster except it also offers an added rotisserie feature. Hamilton Beach boasts that their version comes with everything you need including a drip tray, a skewer for your rotisserie, two racks, baking pans, and a broiler rack. It is a lot smaller than the Oster but also lacks much-needed insulation, so you might also get burned if you touch the exterior while in use. In addition, the Hamilton Beach model is more affordable than the Oster. However, the controls of the Hamilton Beach model are manually operated, and no screen displays the settings. It can also only accommodate two 12-inch pizzas whereas the Oster can accommodate two 16-inch pizzas. To compensate for its lack of space though, it has a two-hour timer while the Oster has only 90 minutes. Instead of getting yourself a conventional toaster, why not consider buying a device, such as the one provided by Oster that has a multifaceted role in your kitchen? The Oster Extra Large Digital Countertop Oven actually seems to be an excellent buy. This is because it allows you to cook casseroles and pizzas with convenience and is large enough to hold baking and roasting pans. What makes this countertop convection oven(1) amazing is that it has the same functions as your regular model but produces enough heat while conserving energy. If your kitchen is usually a busy one over the holidays, then this model may be an excellent choice for you. The reviews are in and this product gets 4.1 out of 5 stars.